Ok, so let's get the reason for it being a double-card day out of the way: after striding once, these gals either make a 22k or 26k column together. Easiest thing in the world. Just slap them on the board. You're Bermuda; you're gonna end up drawing into them. Carla can be a 10k during the early game if you put Marie behind her, which could take the place of 10k vanillas to defend against rush tactics and whatever annoying Grade 2 on-hitters you'll face, if you're the type that values such defense. (Effing Brainy Papio.) She's a 12k beater after Gen Break; pretty standard but still welcome for your Spica plays. 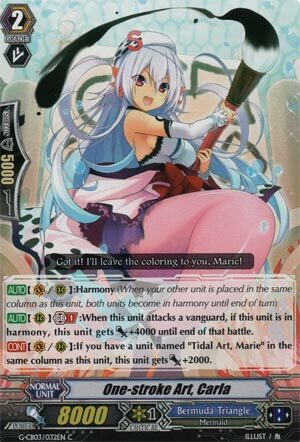 Even without Carla, Marie is a 10k booster after a soulblast. 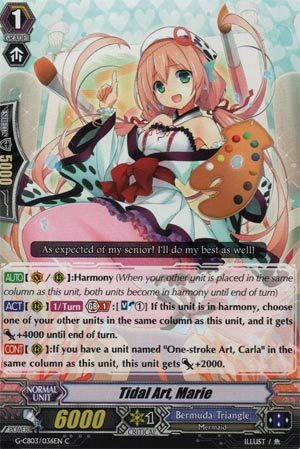 Even though Sweet Paradise, Manya is a 10k booster for basically free, Manya gets ousted for Marie if you're running Carla as well. The name of the game post-Generation Guards is beefy rearguard columns. Forcing 20k shield, even before the silly power ups that Bermudas are gonna hand themselves anyway, gives you the ability to hit like a truck. In Harmony.dek, you can find room for at least 3 of each. In more vanilla decks without rigid unit lineups like Raindear, it gives you dumb columns and the ability to go into G4 Lauris feasibly. Not worth using together. Columns are not BT's thing and either form of Spica will eat shield just fine.